If you follow me on Instagram, you know that my meat-loving husband went vegan about 3 1/2 months ago. He did so for health reasons and has never felt better. I am still eating the exact same way I always have, mostly plant-based with occasional bits of wild fish or lean poultry, an egg here or there and a smidge of dairy every now and then. But his new diet has forced me to make more satisfying, hearty vegan recipes that he enjoys. I find lots of plant-based food very appealing, but my husband needs a little help. I photographed this as a sandwich on sourdough bread with typical sandwich fixings, but you could easily serve this in an avocado half or in a bowl on top of salad greens or in lettuce cups. 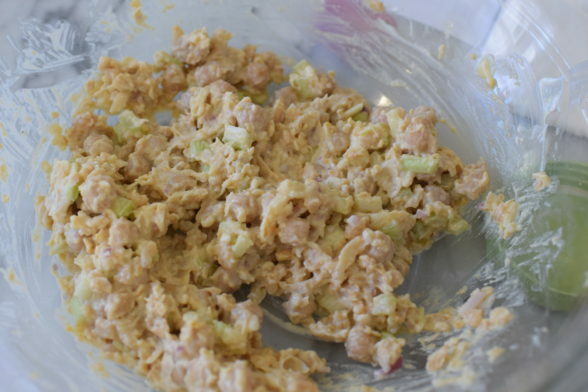 This also is perfect for kids who love tuna but don’t want the fish smell in their lunch boxes. 🙂 I am not following any cleanse, diet, elimination, Whole30, etc. right now (or ever.) I ate a little more than usual over the holidays, but now I’m back to my routine of working out 6 days a week and eating the way I normally like to eat. However, if you have eliminated any ingredients mentioned here, feel free to leave a comment below and I would be happy to offer you suggestions. Also, if you need to serve more people than indicated, this recipe doubles and triples very easily. Happy weekend! Place 1 cup of the chickpeas in a large bowl and mash with a potato masher or fork until chunky puree. Squeeze the lemon on top. 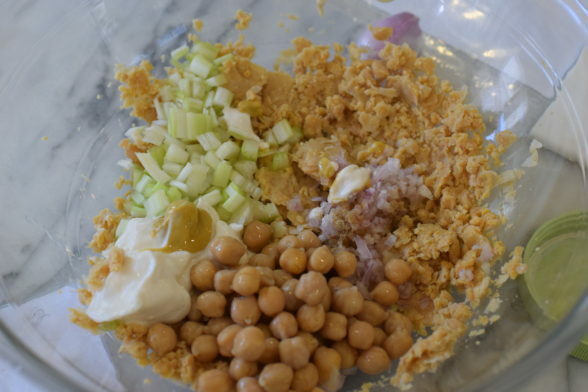 Add the un-mashed (about ½ cup) chickpeas, celery and shallots to the mashed chickpeas. You can also mash all the chickpeas if you like. In a small bowl, combine yogurt/mayonnaise, mustard, herbamare and pepper. Pour on top of the chickpeas and salad ingredients and combine to coat well with dressing. Adjust seasonings to taste. Store leftover in the refrigerator for up to 3 days. A colleague brought this into work and we could not believe how delicious it was!!! Insisted I get the recipie for it. I will make for my family this weekend. Thank you for this recipe! I messed around with it a bit–I am vegan and did not have any veganiase or non- dairy yougurt on hand, so I mashed up an avocado which was very ripe (I always buy them if they are on sale and then find myselfy trying to use them before they are too ripe! This was perfect!) i also used chopped scallions instead of shallots, a bit more lemon, pepper and fresh basil. The salad turned out wonderful, great alone, on greens or multigrain bread. And just a thank you for the inspo! This is super delicious!! Have made it twice. Added fresh cilantro and lime juice instead of lemon this time. Oooh, I must try it with cilantro and lime. Great idea, thanks! Thanks for having faith in me LOL. Kudos to you for going for it! 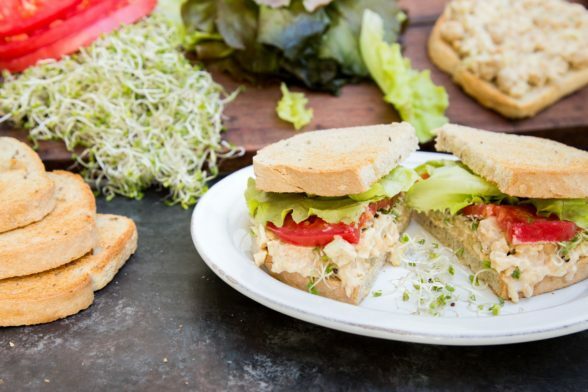 Love the idea of a chickpea smash as an alternative “tuna” sandwich! I’ve been using Herbamare in my tuna salad for years along with finely diced cucumber, red onion, fresh basil, fresh dill and a little vegannaise – good stuff! 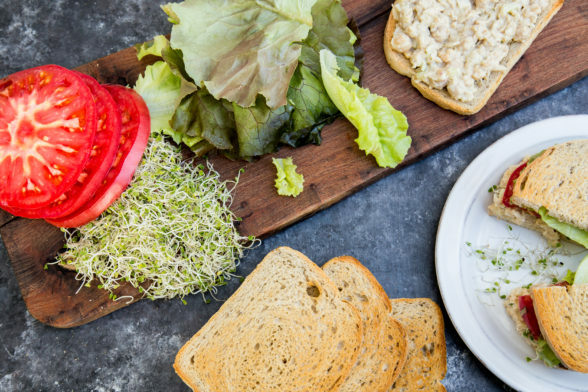 So many tasty ingredients in your tuna salad! You should use the same things but swap out the tuna for chickpeas and see what you think! Great idea. Will try it with chickpeas! Best place in MB to find Herbamare? Checked Grow but no luck. Amazon only? Thanks! Can’t wait to try it out! Already made a batch for lunch at work today. Thanks so much for this…I am loving the vegan recipes! I’m confused…you say mash all but 1 cup chick peas ….but next step is add unmashed peas (about 1/2 cup) …what about other 1/2 cup?? Did you find a dairy free greek yogurt?? Please share!! Yes! Kite Hill makes one now! Woo hoo!! The recipe states 1 1/2 cup of chickpeas in total but you are first mashing only the 1 cup of chickpeas, later you add in the other 1/2 cup of chickpeas (not mashed). Looks delicious! Definitely trying it this weekend. Just clarified the instructions. Thanks! Sorry for the confusion. I meant mash 1 cup and then leave the other 1/2 cup unmashed. I also added in a note that you can mash all of them if you want. Play around with it and go for the texture that is most appealing to you! Thanks!